Established in the year 1974, we Eagle Scale Manufacturing Works, are one of the grand Manufacturers, exporter, supplier and Traders of a boundless compilation of Electronic and Mechanical Weighing Scales. Our product compilation series comprises of Electronic Weigh bridges, In-Motion Weigh Bridges and Electronic Digitizers, which are extensively popular for their rugged construction, longer functional life, operational fluency, ease of operation, reliable performance and minimal maintenance, among our valuable customers, across the nation. We are widely known for the quality offered and this is possible of our constant efforts and will to attain flawlessness in our product range. Furthermore, we provide standardized packaging of the proffered range, to avoid damages caused during transportation. Our company is an ISO 9001-2000 certified company. We are exporting our quality products in African, Bangladesh, Nepal. Backed by a world-class infrastructure, our company is capable of catering to the multiple requirements of our customers, within the promised time frame. In addition to the magnificent infrastructure, we have recruited a team of experienced, knowledgeable and skilled professionals, who work in synchronization with each other to attain organizational goals. In the past years of our dedicated service, we have earned immense trust in the Industry and clients such as Sanghi Industries Limited, Ahmedabad, Gujarat, Tata Motors Lucknow, Uttar Pradesh and Nirma Limited, Ahmedabad, Gujarat. It is because of the incomparable leadership of Mr. Harshad Patel that we have attained such great heights in the Industry. Constant motivation and regular guidance of our leader have motivated us in great terms, to achieve the best quality possible and maintain the strong position. Manufacturing and Trading of Electronic, Mechanical, Electro - Mechanical Weigh Bridges and Weighing Scales. We are backed by a world-class infrastructure facility that comprises of machines and tools based on the latest technologies in market. In order to carry out hassle-free operations, we have categorized our workspace into different sections, so that one section remains unaffected by the tasks in another. Also, we have hired a team that not only manages the operations but also, performs the necessary up gradations. Eagle Scale Manufacturing Works is backed by a team of professionals, who are hired on the basis of technical knowledge, years of industry experience and educational qualification. Furthermore, we conduct different training sessions and seminars to upgrade the knowledge level of our team members. It is because of the constant efforts and undivided dedication of our workforce that we have been able to garner a long list of customers, in the country. 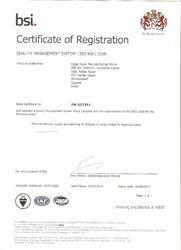 Eagle Scale Manufacturing Works is an ISO 9001-2000 certified company. This certification will be expired on 03/06/2017. Eagle Scale Manufacturing Works is a trustworthy name in the business for proffering an outstanding range of Electronic And Mechanical Weighing Scales. In the past years of our constant service, we have proved ourselves as one of the best in the field. Our company follows a client-centric approach and strives to cater to the numerous clients’ demands, within the promised time frame. In the upcoming years, we wish to continue with our reputation. In the past years, we have gained a vast number of customers, across the nation. All our patrons place immense in our capabilities and depend upon us for the attainment of their diversified requirements. Our prestigious customers are linked with us from a very long time span and provide us with the constant support of their feedback, which helps us in bringing out the required changes in our strategies.